On a fine morning in the lull before Storm Freya was expected to turn the day into high 60mph winds and rain, an impressive 16 of us turned up, partly I’m sure as there was an offer of homemade soup and bread made by Patty the farm owner! 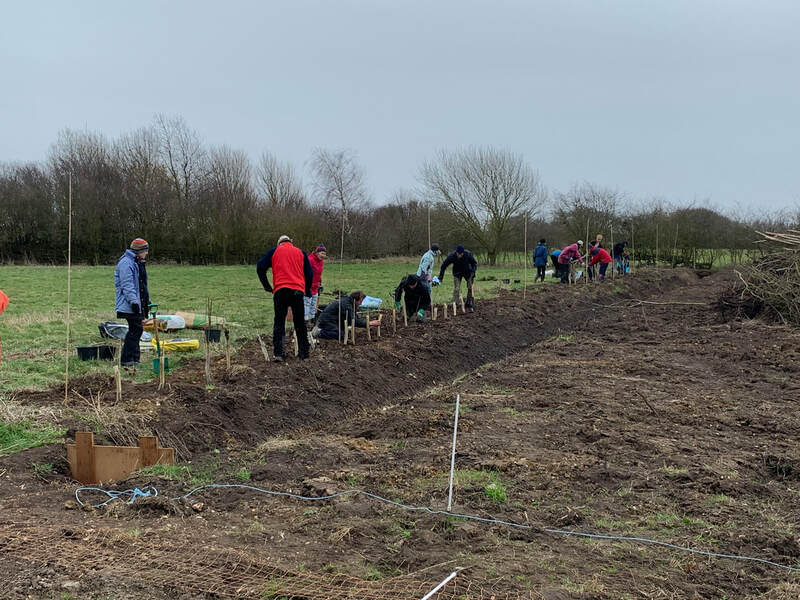 We had a mixture of saplings to plant in the new hedge, 120 hawthorn, but also some hazel, field maple, guelder rose, cherry, rowan, alder, buckthorn and spindle. Fortunately they were labeled; we roughly divided them into 4 piles and split into 4 groups, each with their own plan to plant their quarter of about 40 plus. We settled on a staggered hedge with the plants slightly leaning into the centre, which Jude found after some research, and with Kevin’s knowledge we got it mostly planted by coffee break with just some tidying up to do afterwards. ​A brew, my cake and biscuits devoured, we set to our other tasks. These included trimming an adjoining field hedge but also the hard job, which was to dig out the blackthorn roots and bushes that had been dug up by a JCB and dumped in 2 huge piles (which were 70% earth) and sort them into 3 new piles. The roots and bushes were to be burnt but due to the wind strength and direction, which would have directed fire and smoke at the farm buildings, I decided to give the fire a miss. We stopped for lunch which Patty’s sister Jenny sorted in between milking the goats and making cheese. The homemade soup and bread were soon gone. A good chat then back to it until Storm Freya started threatening. We cleared up and said our goodbyes and the rain started again as we drove off. ​This was a private task, so we were donated £80 for our work which was greatly appreciated. I look forward to coming back in the future to see how the hedge progresses. It was a great day out in the country, and we missed the worst of the storm in the end.